What a book! I never had the opportunity to read Drink Slay Love, but I was taken immediately by its cover. I had heard from other bloggers that this was an author to watch- and now I absolutely know why. 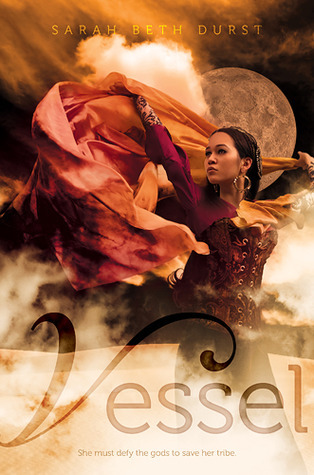 Vessel is an incredible tale of fantasy- focusing around a young girl who is meant to give up her body to be the host for a goddess. The world building in this book is absolutely outstanding. The author has created an entire new world, one with rich mythology and their own stories, histories, traditions, and cultures. And not only one community- but many many tribes within this world, each with their own unique qualities. I never felt like the culture or background in this book was lacking, nor did I feel like there were any gaps or holes I was questioning. The mythology that the author created was amazing in itself- it was rich and so realistic, I wouldn't have been surprised if this was actual mythology that exsisted. The relationship between Liyana and Korbyn was slow moving and complex. It did not turn out the way I expected at all, but I was actually satisfied with that. Liyana feels rejected and alone that her goddess did not show up to inhabit her body. Liyana and Korbyn set out on a journey and what an incredible adventure they have! I could absolutely see this book as a movie. The author has an incredibly visual way of writing and her imagination is rich and full of creativity. If you are a fan of fantasy- hands down you will enjoy this book. I've been on the fence about reading this one, but it sounds awesome! I will definitely have to pick this one up, great review!